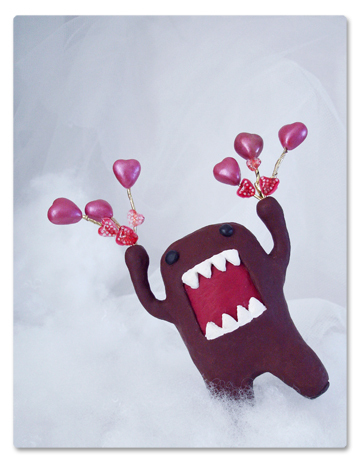 Putting Domo to work again to celebrate Valentine’s Day! He’s holding bouquets of hearts sculpted from polymer clay that were dusted with metallic powder. The smaller hearts are red and pink tinted resin and have tiny clear glass beads embedded inside. Floral wire wrapped with gold metallic ribbon are attached to the hearts. Get outta the way– looks like he’s in a rush!